In working parenthood, any number of concerns can send us down a worry rabbit-hole on a daily basis. How can we do advance planning on issues that would benefit from our focus, without letting them distract us from the present moment? How do we turn our attention to longer-range project planning without letting the details take over our every thought? Whether it’s the return to work after maternity leave, a big work project, or an upcoming house move, events with deadlines and millions of moving parts can become all-consuming. And if we’re not careful, they can take us away from enjoying the life we’re living right this very moment. Setting Time Boundaries around Worry: I’ve used this concept in the past around feelings like anger and sadness. For example, permitting myself until my next meeting to be angry about something. Or letting myself feel sad about the end of a loved one’s visit until a certain time. And then making a pact with myself to let it go after that. With respect to maternity leave, consider setting aside a certain time each day to ponder your return and do some planning. Then, commit to not worrying about it until the following day. Journal about It: Writing in a journal has been incredibly helpful to me in curbing anxiety. I get it all out on the page. Write furiously for a bit. Inevitably have some new insights. And then am able to move onto something else. If you feel like you don’t have time to sit and journal for a few minutes, remind yourself that spending time worrying about this thing that’s taking over your brain is actually consuming *way* more time than you’d spend putting a pen to paper. Take Decisive Action: I’ve discovered that a root cause of my worry is often a feeling that things are spinning out of control, and I can’t get a handle on them. Either because I don’t understand all the moving pieces. Or because certain things are simply out of my hands. Yes, working parenthood has taught me to let go and trust that things will work out. AND, I find that I feel much better (and less out-of-control) if I commit to specific actionable steps and take a few of them daily. If you’re worried about not getting into a daycare in time for your return to work, what can you do to feel more like you’re affecting the outcome? Can you call the daycares to determine your wait list status? Or perhaps go visit them? Can you write them letters (yes, snail mail works wonders!) with a photo of your baby and a reminder of your keen interest in them? Simply getting out there and taking action usually jettisons me out of my worry mode. Lose Yourself In Happy Endeavors: What activities do you do that put you into that sense of “flow,” where you lose all track of time? Perhaps it’s taking a walk outside with your baby. Or playing a game with your kindergartener. Or cooking. Doing Sudoku. Or even working intensely on a project you need to complete for work. Whatever it is that puts you in that state of flow can take your mind off the subject you’re worried about. The transition to working parenthood is a tough one. And though I always try to encourage new parents to think about the return to work as a process, not a single event, it’s a time that can be fraught with lots of worries that can truly take over our minds. Try out these 4 strategies. And if you find you’re still struggling, please do seek out extra professional help. (Check out Dr. Emma Basch’s great advice on this topic here: Normal New Working Mom Anxiety or Something More? 4 Questions to Ask Yourself.) There’s so much joy to be savored in parenthood that it’s worth learning ways to curb the worry…so we can focus more on the little miracles our kiddos present us with daily. 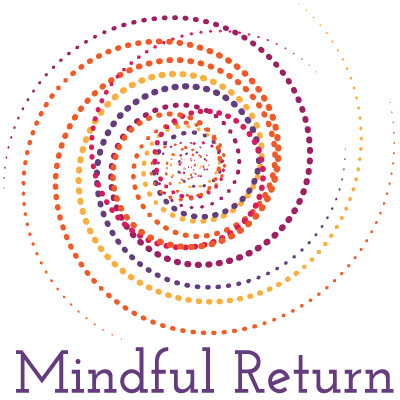 If you need more help getting your head in a better place to return to work after maternity leave, join us for the next session of Mindful Return. Want more practical tips on working parenthood? 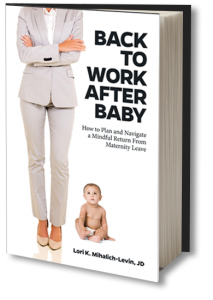 Check out my book, Back to Work After Baby: How to Plan and Navigate a Mindful Return from Maternity Leave. 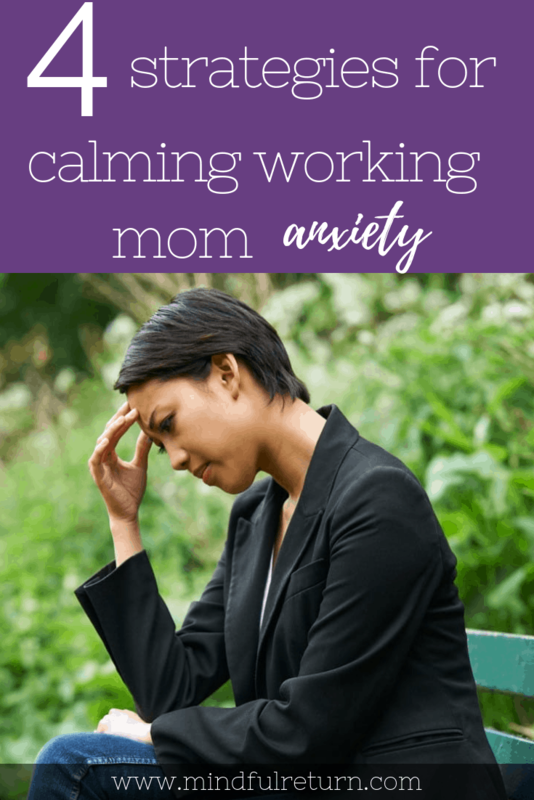 Be a calmer working mama. Join the thriving Mindful Return community to receive our beloved, short, weekly newsletter. We're here to help you feel empowered to trade your mama guilt for meaningful connection. ©2019 Mindful Return // Lori Mihalich-Levin. All Rights Reserved. At Mindful Return, we know that calm, thoughtful planning, and time for reflection, are keys to success in working parent life. Our FREE guide, 99 Questions to Ask Yourself Before, During, and After Maternity Leave, is our gift to you and your new bundle of joy. Thanks! Check your e-mail for more information.